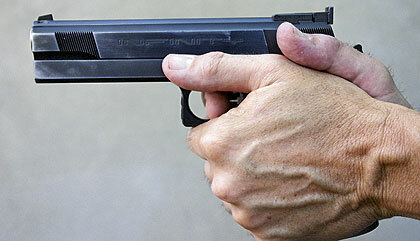 One of the most important keys to shooting accurately is how you grip the gun! In this video I show you the two handed grip that I use and that I have learned from watching other accurate shooters. I also talk about arm and shoulder placement which is more important when shooting large caliber pistols but even when shooting airguns that have virtually no recoil you may as well practice the correct hand arm and shoulder placement for when and if you do start shooting heavy recoil guns. The main hand grip points I talk about in this video are how to overlap your finders and thumbs and also the pressure used by each hand that will make all the difference down range when shooting at targets.